While the market has already assumed a digital infrastructure will succeed our asphalt one, city government leaders still haven’t accepted that by making the same financial commitment to free public wi-fi. It’s largely a generation thing and it’s inevitable the investment will come eventually, but for the cities with progressive leaders that implement them now, they’ll realize an economic and cultural windfall as a reward for ‘letting go’. 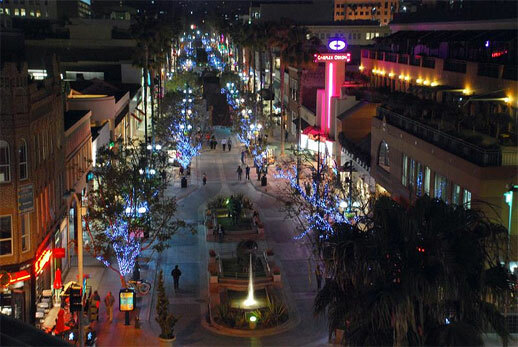 It should be no surprise Santa Monica is also leading the nationwide trend of establishing pedestrian-only districts – it goes hand in hand with a digital infrastructure. Image: The pedestrian-only Third Street Promenade, by Malingering. I’m near Santa Monica right now, looking for free WIFI, which is how I found this post. Do you know where the “key hot spots” are?